Designing metamaterials; thermal emitters; adjustable wings. Sandia National Laboratories has developed an inverse-design software technology that automates the design of optical metamaterials. Metamaterials are artificial materials containing arrays of metal nanostructures or mega-atoms. Some metamaterials are able to bend light around objects, rendering them invisible. But they only interact with light over a very narrow range of wavelengths, according to researchers. The Institute of Physics describes metamaterial technology here. In theory, these materials could be used for cloaking devices. In addition, they could be used to make thinner lenses for satellite imaging and interstellar telescopes, according to Sandia. Controlling the properties of metamaterials is a big challenge. The meta-atoms can be designed in various ways. A certain shape can be used to bend light. If you change the shape, it might do something different. Some have developed software technologies, which can simulate what meta-atoms will do in the field. But this is a tedious process with a lot of guess work involved, according to Sandia. 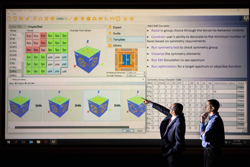 To solve the problem, Sandia has developed Mirage, a software tool that helps designs optical metamaterials. The software tool helps users to define the properties they want and how the materials will interact. Then, the software generates designs by matching the product definitions from a library of 100 templates. In addition, users can develop their own designs. “Mirage is an all-in-one tool,” said Ihab El-kady, principal member of the technical staff at Sandia. “Not only does it tell you what the metamaterial looks like, it allows you to explore various configurations, simulate the system, validate the chosen behavior, visualize its response and optimize its functionality within your fabrication constraints. National Institute for Materials Science (NIMS), the University of Tokyo, Niigata University and Riken have co-developed a multi-layered metamaterial using machine learning. With metamaterials, researchers have developed an ultra-narrowband wavelength-selective thermal emitter. Thermal emitters have the ability to manipulate electromagnetic waves in systems. The development of metamaterials with desirable thermal emission could pave the way for better energy efficiency in systems. The properties of these components make them attractive for various applications, such as wavelength-selective heaters, infrared sensors and thermophotovoltaic generators. One way to develop metamaterials is to characterize the material structures using empirical means. But as stated, it’s difficult to develop and control the materials. So, researchers have developed a method of designing metamaterial structures using a combination of machine learning and the calculation of thermal emission properties. In the lab, researchers devised three types of materials in 18 layers of varying thickness. Then, they applied machine learning and other calculations to eight billion candidate structures. The Massachusetts Institute of Technology (MIT), NASA and others have developed a new type of airplane wing based on a mechanical metamaterial technology. Using a self-adjusting, passive wing-reconfiguration technology, the wing can automatically change shape to control a plane’s flight, according to researchers from MIT, NASA and others. It could provide more flexibility in the design and manufacturing of future aircraft. Most planes use separate movable surfaces such as ailerons. These structures control the roll and pitch of the plane. In contrast, the new plane design incorporates a mix of stiff and flexible components.